High school senior, Nariyuki Yuiga, comes from an impoverished family. He is eager to secure a full scholarship, known as “the Special VIP Recommendation,” to college before he graduates high school. His principal agrees to give it to him, but there is one stipulation. He must tutor the three smartest girls in school, Rizu Ogata, Fumino Furuhashi, and, Uruka Takemoto, so that they can get into their target colleges. However, each girl wants to focus on a subject area in which she is not at all good! We Never Learn, Vol. 3 (Thus, [ X ] Geniuses Never Learn; Chapter 17 to 25) opens in the aftermath of the accidental kiss between Nariyuki and Rizu. Now, the duo is racing across town on bicycle, trying to catch a book bag. Why? It seems that all three girls have some kind of crush on Nariyuki, and it is starting to affect some of their grades, so why is Nariyuki so oblivious? 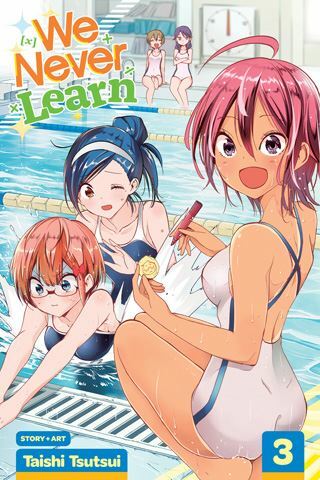 THE LOWDOWN: The We Never Learn manga is a high school romantic comedy of the shonen manga (comics for teen boys) variety rather than the shojo (comics for teen girls) variety. It is similar to the manga series, Nisekoi: False Love and the classic Strawberry 100%. (both of which are also published by VIZ Media). We Never Learn Graphic Novel Volume 3 offers fanservice and raunchy comedy, as usual, but not as much as in the the previous volume (Vol. 2). Creator Taishi Tsutsui focuses on revealing the personalities of both the lead and supporting characters. It is almost kind of intimate, at least as far as this kind of manga could be intimate. Once again, Camellia Nieh's sharp translation catches the eccentricities of the characters and of this lively narrative, especially the end of Chapter 25.